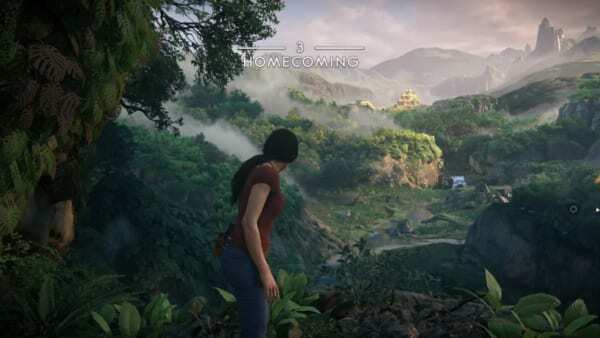 This page contains a walkthrough for Chapter 3 – Homecoming for Uncharted: The Lost Legacy, including main story objectives, weapons, items, and enemies encountered in the game. 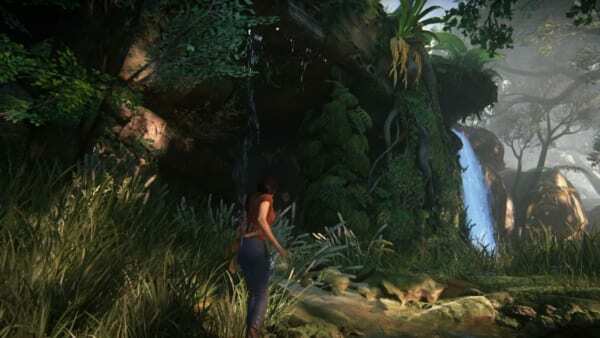 Chloe and Nadine will split off at the start of Chapter 3 – Homecoming, so your main goal is to lead Chloe to the car where Nadine is. Go down the mountain through the lone pathway. Once you are on the tree bridge, it will collapse, leading you to find another way to get to the car. Jump down onto the mud and slide down the pathway. At the bottom of the cliff, throw a rope near the gap and swing to the other side. 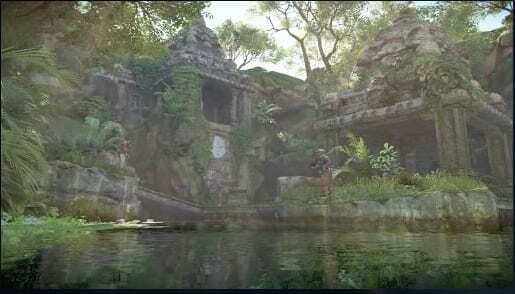 Note that there will be an icon popping up where you can throw your rope to. Once you’re on the other side, climb up your rope and swing to the left to reach a cliff leading upwards. Continue climbing until you reach Nadine and the car. Drive the card through the straightforward path until you reach a dead end. The dead end is marked by the flamingos gathering in the area. Drive up to the first waterfall that you will see and you will be lead to a pathway behind the falls. Continue driving through the pathway until you see a gate. Exit the vehicle. Upon reaching the gate, a short cutscene will commence. Grab the wench at the front of your vehicle then hook it on the gate. After connecting the wench, Chloe and Nadine will be ambushed by a small band of insurgency soldiers. Take cover and take out the soldier using the Para 45. that Chloe automatically has. After eliminating the soldiers, go back to the vehicle and pull down the gate. Once you opened the gate, continue driving towards the opened path. Continue driving across the bridge and into the small cave. At the end of the path, a cutscene will commence. Use the vehicle to ram some of the insurgency soldiers standing near the pond. Continue ramming the other soldiers while Nadine fires at them. You can also quickly take cover behind your vehicle and take out the remaining soldiers using your firearms. Nadine will notify you if the coast is clear. Head to the nearby truck bed and open the weaponry case to obtain a Silenced Pistol. Climb up the gate at the end of the path and use the giant wheel to open the gate. Head behind the wheel and into the door, then jump across the ledge and climb down. Once you head back to the vehicle, Chapter 3 will end.